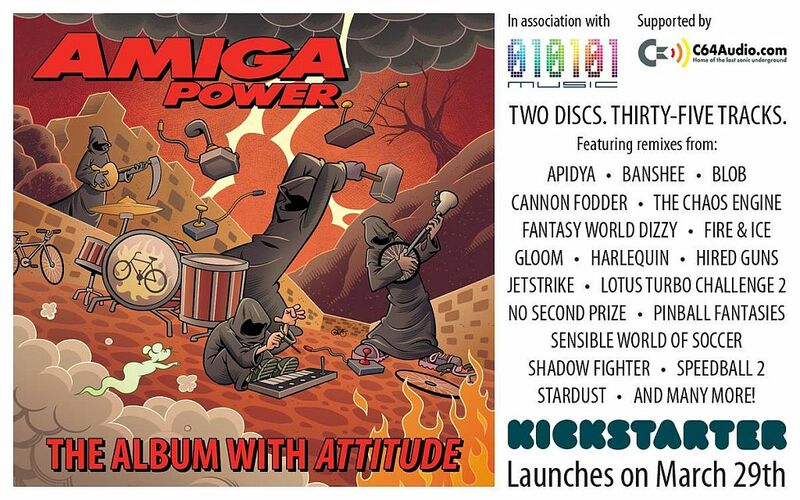 Indie Retro News: Amiga Power: The Album With Attitude - A tune banging retro remix Kickstarter launching this Friday! Amiga Power: The Album With Attitude - A tune banging retro remix Kickstarter launching this Friday! This is seriously great news for anyone who loves retro gaming music, especially from the Amiga! As during the weekend just gone by, we were told that a new Kickstarter is launching this Friday that is sure to excite many in the Amiga community. Titled as ' Amiga Power: The Album With Attitude ' comes a new Kickstarter from Matthew Smith that will feature not just a Mighty Booklet, but two discs spanning thirty-five tracks of remixes from classic games such as Apidya, Banshee, Blob and many many more! According to the Facebook group, both of the AP album's CDs will be jam-packed with spiffing new remixes such as disc 1 it will include Chris Huelsbeck, Andrew Barnabas, Jon Hare, Barry Leitch, Mike Clarke, Olof Gustafsson and Allister Brimble. And for disc 2 however it will feature brand new remixes as the first, including all these fab tracks by Brian Sadler, Fabian Del Priore, Jogeir Liljedahl, Jason Page, Allister Brimble, Patrick Nevian, Matthias Steinwachs and Tim Wright!